Do you have a loved one who enjoys meditating or is interested in starting a meditation practice? There are many creative and thoughtful gifts you can give that will help them in their journey. You should look for gifts that promote mindfulness and support a regular meditation practice. There are plenty of options that help promote self-reflection and remind the receiver to stay in the present moment. We’ve gathered 10 awesome meditation gift ideas that make great presents for new meditators and enlightened beings. The Buddha Board is very simple in its design and use but impactful in its meaning. Water is used as the “ink,” appearing as black strokes on the surface. It’s the perfect gift for artists and writers. The board can be used to write down the day’s worries and anxieties, so you can just watch them fade away. It’s also great for sketching and drawing while refocusing the mind. Miniature Zen Gardens are a great way to de-stress at work and give a visual reminder to check in and be in the moment. A zen garden kit makes an excellent gift for office workers as the kit comes with everything they need to get started. This kit comes with the sand, a beautiful wooden base, a bamboo rake, and rocks. It can be displayed on a desk or elsewhere in the home. When the owner needs some stress relief or just wants to connect with the moment, they can use the rake and rocks to create beautiful designs. These miniature zen gardens are loved by office workers because they add a little zen to their desk and help deal with stress and boredom. This is the perfect gift for people with stressful jobs. Mala or meditation beads make a fantastic gift for anyone who meditates regularly. Traditional malas have 108 beads and can be worn as a necklace or a bracelet. They are used in meditation to count breaths or a repeated mantra. When they’re worn daily, they can also remind the meditator of an intention or to check in and be in the moment. This set of mala meditation beads is made of rosewood. They are deep ruddy brown beads with a traditional tassel. Rosewood improves circulation, strengthen spiritual aura, and helps repel negativity in your life. It’s a great choice for most meditators. You can also learn about mala beads meaning by color to select the perfect mala gift. Many adults have turned to coloring as a way to combat stress and express themselves creatively. It’s also a great way to promote mindfulness or have a meditative experience. This Color Me Calm book features 100 pages of illustrations meant to promote meditation and relaxation. Coloring helps you focus on the now, while also accepting imperfections, and learning to take risks and experiment. The illustrations include nature scenes, mandalas, geometric patterns and more. This book was designed by an art therapist and an artist, so you may find it more relaxing and meditative than other books. There are plenty of meditation coloring books to consider as gifts (or to buy for yourself). 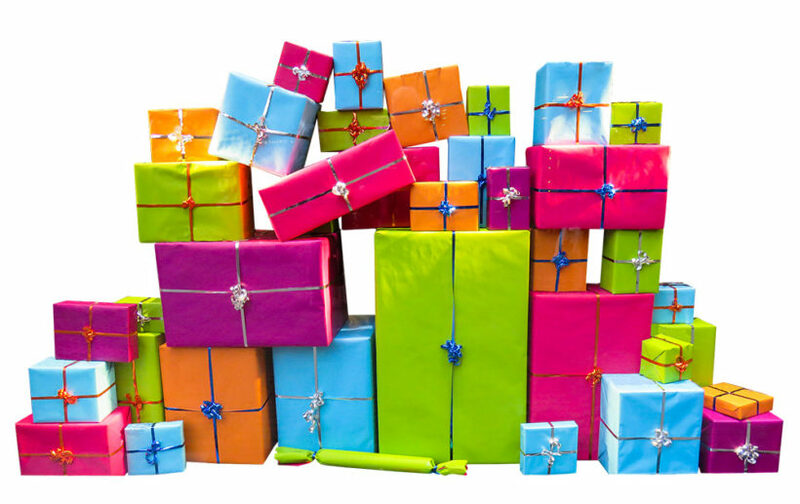 Don’t forget to include some colored pencils, pens, or markers with your gift. If you’re looking for beautiful meditation gift ideas, these blankets and tapestries of lotus flowers are a fantastic idea. The round mandala pattern blankets, are made to be used on the beach, but they are so versatile. They’re great for picnics, meditating outdoors, or displaying in the home. These also make a great gift for someone looking for a tapestry to hang in a meditation room. They can be laid on the floor and combined with a meditation cushion or meditation chair to create a temporary calm space to meditate. The blanket is 100% cotton in the round shape of a lotus flower with a 72″ diameter. For Egyptians, the lotus flower was a symbol of re-birth. In Buddhism, it represents intelligence, wisdom, and knowledge. Available in ocean blue turquoise, red and yellow, & purple and pink prints. This beautiful book is designed to be given as a gift, filled with inspirational quotations from Zen master Thich Nhat Hanh. The quotes are short but meaningful, giving an opportunity to reflect on the meaning in one’s own life. It’s also the great way to check in and turn your attention inward. This is a book they can reference before their daily meditation as well. This is a great book to give someone who is at the beginning of their spiritual journey or a loved one who regularly meditates. Check out more books on meditation and mindfulness for beginners. This is a gift that is not only functional but makes a beautiful display piece in any meditation space or home. This singing bowl is made in Nepal based on the ancient Tibetan meditation tools. They’re often used to signal the beginning and ending periods of silent meditation or used for Feng Shui to scare away evil spirits. The beautiful sounds can be created by tapping the side of the bowl or by rubbing the mallet around the rim. This singing bowl set comes with a 4″ singing bowl, a striker, and a pillow. Available in brass or gold. If you’re looking for meditation gift ideas that are functional and beautiful, a singing bowl is a great option. This gift is perfect for anyone who uses incense when they meditate or in their home. This set is a great value, coming with 12 different scents: Sunrise, Romance, Fortune, Rain Forest, Celestial, Super Hit, Nag Champa, Jasmine Blossom, Midnight, Sandalwoof, Patchouli Forest, and Blessings. Each box includes 12 incense sticks. This is a great gift for people who are new to using incense because of the variety of scents. This is also good for people who regularly use incense because it gives them a nice collection to use. If you’re buying this for a beginner, you may want to include an incense burner in the gift. Some people who do not enjoy incense prefer to utilize essential oils and aromatherapy as a part of their meditation. Different oils can be used alone or mixed together create meditation blends. These scents can help ground the meditator or create a sense of calm. They can be used in a diffuser or by dabbing the oil on the third eye. Essential oils also have tons of other uses throughout the home. This set comes with 6 different essential oils: lavender, sweet orange, peppermint, lemongrass, tea tree, eucalyptus. This gift set is available in a small and large size, the difference being the quantity of each oil. Check out more essential oils for meditation and aromatherapy diffusers. This is a fantastic gift that allows your loved one to carry a little reminder of their intention around in their pocket. 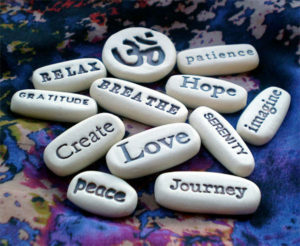 Intention stones are made of clay and stamped with inspirational messages. The sets are customizable with phrases you choose, so it makes a personalized gift for your loved one. For meditators who sit on the floor, using a cushion helps to make their practice more comfortable so they can meditate longer. If your loved one is new to meditation, a zafu cushion is a thoughtful and practical gift that will aid their practice. With an organic cotton twill cover and buckwheat stuffing, this crescent zafu is a great option for many meditators. Check out more zafu and zabuton cushions. This is a fun meditation gift that’s perfect for tea drinkers and coffee addicts. 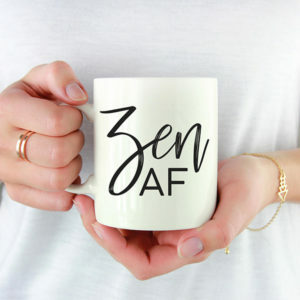 This classy mug says “Zen AF” on the side, taking a humorous look at the constant struggle for a peaceful mind. Made by the Mug Mama, it’s available in 11 oz. or jumbo 15 oz. size. The design is printed on both sides and it is dishwasher and microwave safe. Include some of your loved one’s favorite coffee or tea to create a lovely gift set. If you’re looking for a gift to bundle with that mug, this tea set is perfect. Yogi Tea makes high-quality tea blends for every occasion. This relaxation variety pack features 5 different stress-relieving herbal teas. The varieties are Calming, Comforting Chamomile, Relaxed Mind, Honey Lavender Stress Relief & Kava Stress Relief. All flavors are perfect to drink before or after meditating or enjoy when winding down before bed. Every Mom who tries to meditate in a noisy house of kids or anyone who’s tried to create their own meditation space will appreciate this gift. 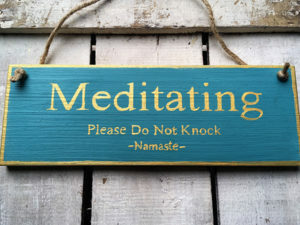 Inspiration to Art makes gorgeous wood signs that say “Meditating Please Do Not Knock. Namaste.” Any meditator can create a calm and quiet space and let everyone know this is their time to meditate. Customize with 12 background colors and 13 colors for lettering. Crystals are a powerful tool to help deepen and enhance a meditation practice. For people new to crystals, it can feel intimidating. This gift set is perfect for any meditators who are interested in incorporating crystal in their practice. It comes with seven chakra stones, as well as sage and essential oils for proper cleansing. This set is a great introduction for using crystals in meditation. Aromatherapy is a great way to add extra calm and focus to a meditation session. Did you know you can take the benefits of aromatherapy with you everywhere? 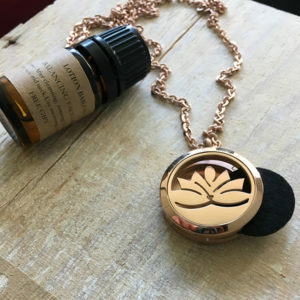 This aromatherapy necklace is perfect to get the benefits of calming and stress relieving scents anywhere. With a beautiful Lotus flower design, apply a few drops of oil to the felt and insert it into the necklace. Choose from four felt colors to match the giftee’s style. If your giftee prefers to keep their aromatherapy at home, candles are a great option. They are relaxing and add a warmth to any meditation practice. Wax and Oils makes soy candles with essential oils. This set includes three relaxing scents: vanilla, peppermint eucalyptus, and lavender. Perfect for meditating or relaxing. Check out more candles for meditation. 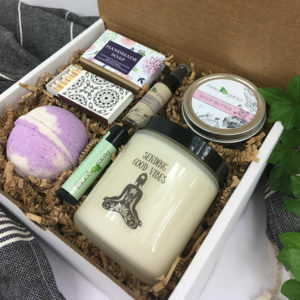 If you just want a nice gift set to make your loved one feel pampered and relaxed, this Good Vibes box from Peace Organics is a lovely present. The set comes with a soy candle (your choice of scent), matches, natural soap, lavender bath bomb, lip balm, body butter, essential oil body spray, and your custom message inside. This set is perfect for college students or overworked adults who need a little pampering. If you’re looking for gifts to help relieve stress and calm the giftee, check this out. 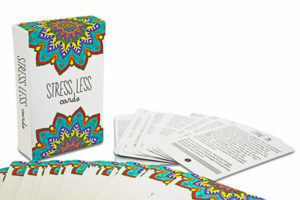 Stress Less Cards is a set of 50 exercises to inspire and increase mindfulness. Each card has an exercise to help relieve anxiety and stop stress in its track. The deck is compact and easy to put in a purse or backpack or keep at work to use at any time of day. This funny t-shirt is a perfect gift for anyone who meditates. 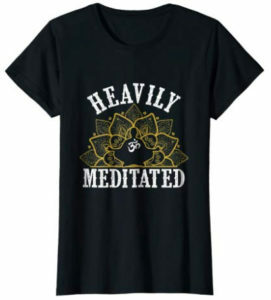 It’s a play on words, saying “Heavily Meditated.” Available in men and women’s sizes in the colors black, brown, dark heather, heather blue, and blue. Need more gift ideas? Check out these yoga gifts.